Update 1 for Delphi XE2, C++Builder XE2 and RAD Studio XE2 is now available. 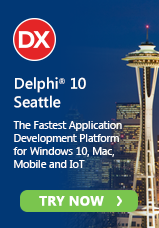 Update 1 for Delphi and C++Builder XE2 is now available. This update includes more than 120 bug fixes and addresses an important licensing issue. We were recently made aware that some code in the 3D support in FireMonkey may be similar to code in GLScene, an MPL open source project. We worked with Eric Grange, a key contributor to the GLScene project to remedy the issue and replace the code in question. This update replaces the code in question and therefore it is highly recommended that you rebuild any applications compiled with the original FireMonkey units using this update. If you have created any FireMonkey 3D applications, you will need to rebuild those applications using the updated version of Delphi or C++Builder to ensure that your applications have a valid redistributable license. Also included in this update are over 120 bug fixes, including many FireMonkey design time and runtime bug fixes, the addition of new VCL Styles, VCL Styles design time and runtime fixes, IDE fixes to improve stability, C++ and Delphi compiler fixes and more. This update involves fully uninstalling and then reinstalling the product. We strongly encourage you to update as all future patches will be based on this build and this release will be the only way to get updates. We plan to update often and evolve and improve FireMonkey quickly. Thank you for your continued support and for making XE2 the biggest and best RAD release ever. "the total download may be up to 3gb" - are you going to provide an .ISO so that we don't have to re-download on all PC's? I hope that I'm wrong but do we REALLY have to uninstall, download 3GB and reinstall everytime when an update comes out? It seems that I have no other choice though. Those AVs in rtl1x0.bpl which are killing me since Rad Studio 2007 come up in XE2 also. Is there going to be another update for XE? Emb used to release around 3 updates for each release. Yes, there are more updates planned. No, only for this first one apparently. Does this mean that you will bump up the count for the number of times you can install Delphi XE2, as you are now forcing us to do a reinstall? Future updates will be available as an update that you apply to your existing installation of the product. We just did it as a reinstall this time to be extra careful to resolve the license issue. Don't worry, reinstalling on the same computer doesn't count as an additional registration.